CoolSculpting is a non invasive procedure that freezes your fat cells. The CoolSculpting machine has vacuum applicators that are placed on your skin and pull the fat up into the applicator. Inside the applicator are cold plates. These cold plates allow a controlled reduction in the temperature to a level that will freeze your fat cells, but not cause damage to your skin cells or other tissues. Most applications take an hour. Once the treatment is complete, there isn’t anything that you need to do other than wait for your body to clear the fat cells. Once frozen, the fat cells die and are naturally broken down by your body, with noticeable results just weeks after the procedure, and continued fat reduction over the next 3 months as the body naturally expels the frozen cells. Each treatment will get you about a 20-25% reduction in the thickness of the fat layer. At Imagen, all of our CoolSculpting treatments are applied by our experienced physicians. CoolSculpting works best if you have small, focal pockets of stubborn fat. If you have fat all around your tummy and love handles, liposuction may be a better (more cost effective) way to treat your stubborn spots. You also have to have enough skin laxity for the applicator to pull the tissues in. The CoolSculpting applicators can only treat the area that gets pulled in. If your skin is too tight or the fat is too thick, you won’t get a good “take” and thus your results will be less than ideal. This is where having an experienced physician do your treatments is a great benefit. Many offices only offer CoolSculpting (or other noninvasive treatments) for fat reduction. We will always be honest about what we think you can expect from our treatments. If you are looking for a treatment with no downtime and/or no scars or incisions, CoolSculpting may be a good alternative to liposuction for you. It is important to have realistic expectations as far as what CoolSculpting can do for you. CoolSculpting works. However, many of the advertisements that you see with before and after photos are patients who have had 6-12 CoolSculpting treatments. If you are hoping to get a bikini model body with just one treatment, you will likely be disappointed. If you have a lot of skin laxity before your CoolSculpting treatment, you will likely have loose skin after the treatment as well. CoolSculpting alone doesn’t do much in terms of tightening skin. If you want to know about options for tightening skin after CoolSculpting, please read our blog, Saggy Skin After CoolSculpting? As a noninvasive treatment, CoolSculpting is well tolerated with few risks. It is not uncommon for patients to have some bruising and possibly mild swelling after a treatment. This can typically be helped by wearing some sort of support garment (think spanx). There will likely be some mild soreness to the area, like after you do a hard abs workout. Patients rarely need anything stronger than ibuprofen or acetaminophen to control the discomfort. Many patients have some numbness in the treated area as well. This is caused by the swelling and usually resolves on its own after a few weeks. A rare complication of CoolSculpting is paradoxical adipose hyperplasia. This is where, instead of shrinking, the treated area actually gets larger. It has an incidence of <0.01% (you can read more about that here) and can be treated with liposuction if necessary. 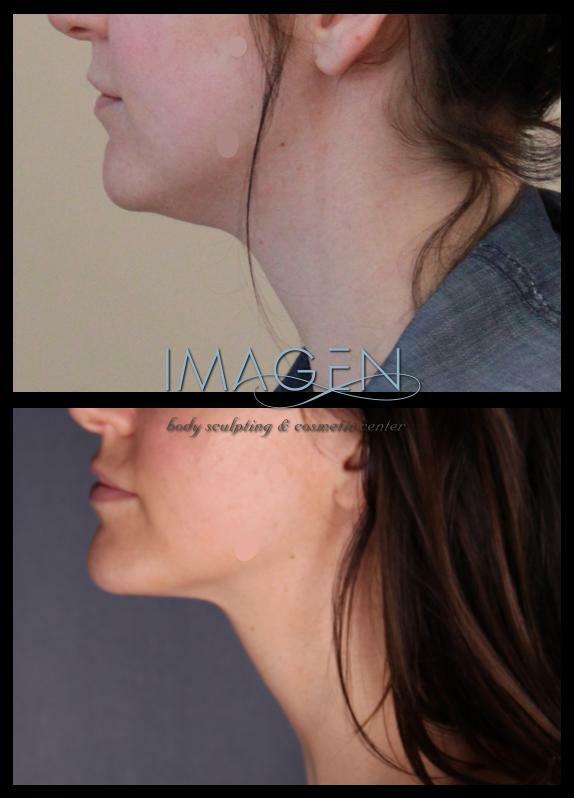 At Imagen, we price CoolSculpting based on the number and size of the applications. There are two sizes of applicators, most fall into the “small” applicator category. We charge $650 per application for small applicators. For the large applicators we charge $1300 (it’s basically double the size of the small one). We do offer a tiered pricing system, so the more applications you purchase, the lower your price per application. We would be happy to discuss the tiers when you come in for your consultation. What sort of results can I expect from CoolSculpting? Each treatment will get you about a 20-25% reduction in the thickness of the fat layer. That doesn’t mean 20-25% of your whole body. You will definitely get better results with repeated treatments to a single area and we usually recommend that a patient treat a single area fully rather than trying to spread out the applications over their whole body. In other words, you’ll get better results if you have 4 applications to your lower tummy than if you do 1 to your lower tummy, 1 to your upper tummy and one to each inner thigh. Be sure to ask when looking at before and after photos, how many applications the patient had to each area. This will help you decide if CoolSculpting can get you enough reduction to reach your goals. Also keep in mind that, once the applicator has been placed, your results depend on how your body responds to the treatment. Some patients get more significant results than others. If you think that you may be ready to move forward with CoolSculpting, or even if you just want more information, we would recommend that you come in for a free consultation with one of our doctors in Omaha, Nebraska. If you live outside of Omaha (we have patients from South Dakota, Des Moines and other cities in Iowa, Kansas City, Grand Island, Kearney and Western Nebraska and even Denver and other cities in Colorado) we would be happy to review your photos in a virtual consultation. To schedule your appointment, please call/text our office at 402-509-8473. We look forward to meeting you!